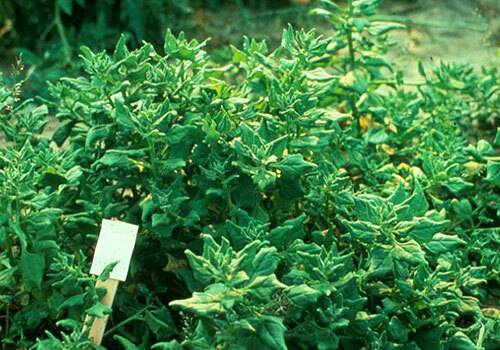 Used like spinach in cooking and salads, this frost-tender plant is ready for harvest when spinach is on the wane, and stays productive throughout summer. Also makes an attractive foliage plant for borders and beds. Benefits from light shade in midsummer in warm regions. Tolerates a wide range of conditions, but prefers well-drained, sandy soils, rich in organic matter, pH 6.8 to 7.0. While somewhat drought-tolerant, flavor is best with consistent moisture. Needs to be started inside in much of New York. not native to North America - Native to New Zealand, Australia, southern South America, and some Pacific Islands, including Japan. Propagate by seed - “Seeds” are actually fruits containing several seeds. Days to emergence: 14 to 21 - Soak seed 24 hours before planting to speed germination. “Seeds” are actually fruits that contain several seeds. Germination is slow and uneven. Soak seed 24 hours before planting to speed germination. In Zone 6 and warmer, direct seed after last frost about � inch deep in hills spaced about 2 feet apart. Plant 3 seeds in each hill and thin to the strongest plant. In cooler zones, start seed inside 3 to 4 weeks before last frost. Transplant about 2 to 3 weeks after last frost. While drought-tolerant, flavor is best with consistent moisture. Mulch to retain moisture and suppress weeds. Browse New Zealand spinach varieties at our Vegetable Varieties for Gardeners website. Most sources offer just the generic species. Occasionally the variety ‘Maori’ is listed.